"In traditional Tai Chi training, a number of postures besides the Wuji posture of Commencement were used for standing cultivation practice. These include the familiar ‘Bird’s Tail’ movements Peng, Lu, Ji and An plus Dan Pien - Single Whip. 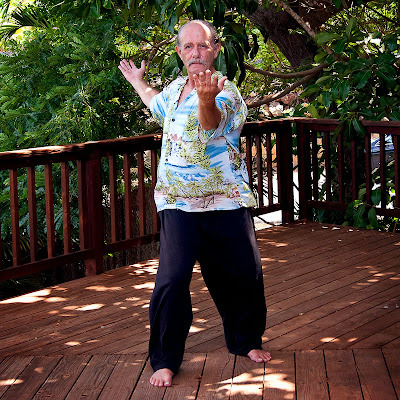 Since many readers will be familiar with Tai Chi’s most basic postures, I have decided to present two additional Tai Chi cultivation postures they might not know about. These two postures can be used to cultivate all the basic energies of Tai Chi. The first posture is done in the standard forward Bow Stance. It requires quite a lot of flexibility to execute fully and so is often begun with a far less pronounced stretch of the back arm. The amazing thing about this posture is that as the body hollows and opens up, it does so in a manner that naturally generates spiral energy. The potential for spiral energy actually comes from the unwinding of the tautly stretched tissue, especially in the hips and Kua."